In celebration of passing inspection, I will be busting my box of Fantastic Four Archives live on justin.tv tonight. It was mentioned by a whole bunch of people how annoying it is that video breaks tend to pay no mind to the base and regular inserts. Well, because I’m not on a time limit and like to savor the break and make it last, I tend to show every single card, even in really big boxes. 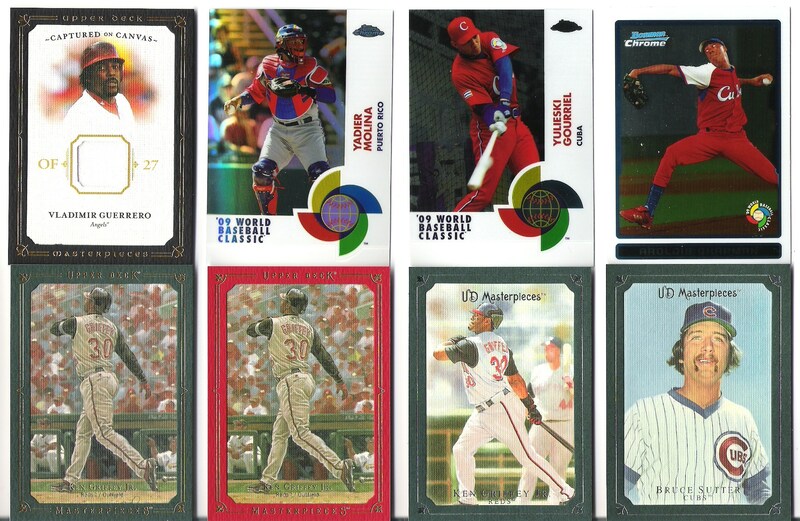 Also, if the non-sport and promised sketch card do nothing for you, I have a box of ’09 UD A Piece of History that should come just before or just after Christmas. If it comes after, I will do a live box break of it whatever day it arrives. If you’d like to come see it unfold in all it’s crappy $20 webcam glory, come on by. And if it’s as it I remember, it’s very easy to sign up to Jtv, so please do. That way, you can chat with me as the breaks are going down. And fear not, I will be doing the requisite blog posts in the week(s, depending on laziness/scanner access) after the break. Finally, I’ve got a couple good ones so far, but I am still looking for more opinions/thoughts/experiences that may be helpful for the “Collecting for Beginners” post. 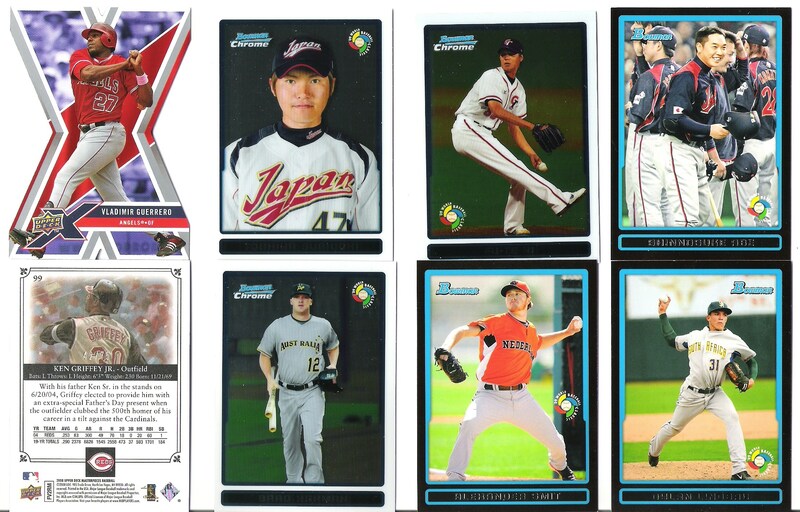 WBC cards! I'm one of the proud few who actively collects them, so you're looking to get rid of yours, look no further. That is the back of the Masterpieces framed parallel I received that was numbered. Now let’s see the front! Three Griffeys! I can do without many parallels, because often they don’t add anything worthwhile, or waste everyone’s time. But these parallels… these parallels I lurrrrrrrrve. I’ve said before that the slightly raised frames are the closest parallel that artsy/retro-type sets have to the refractor (of which that Yadier Molina is). And they come in as just as many colors! But seriously, while the base cards themselves look very nice, they aren’t that exciting. Throw a variously pretentiously named colored border on there, and bam!… Whole ‘nother level. Bruce Sutter deserves a frame. And I didn’t even get to the Vlad Guerrero jersey, my first Masterpieces hit. They are as nice as advertised, if anyone hasn’t gotten one yet. Is there actually anyone that hasn’t gotten one yet? If not, I highly recommend. Now then, I have a request. I’m beginning work on a post, a guide of sorts, to help beginner collectors. It’s a sort of complicated hobby, and we can all use a little help sometimes. And there doesn’t seem to be a lot of help coming from official channels. I can say what I have to say, but I’d also like to get the opinions of other card bloggers, as well as any other collectors, people who do or have worked at the card companies if possible, anyone who might be able to give some perspective on the Hobby to as it is today. I will use as much as I can that’s applicable. Your experiences, collecting mindset, how you got into it, what you like, what you think of the current state of things, and your advice to new and/or long-absent collectors. And hopefully I can make sense of everything and turn it into something useful to new collectors. So spread the news please, because I want as much feedback from as many different perspectives as possible. You can leave your thoughts in the comments, email me, or respond via twitter, whatever works for you. Thanks. I Can Has Trade Bait? I Wanna Talk About Me!